Welcome to the Little River Outfitters Wader Department. Here you will find our offering of breathable waders for your favorite sport, fly fishing. You can probably tell, Little River Outfitters loves to stock, merchandise and sell waders. We have devoted plenty of space to this department in our store and lots of information on our website. Waders are important to us and you. 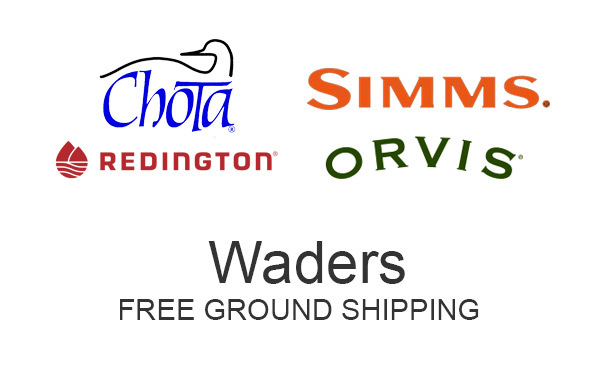 We sell waders made by Chota, Orvis, Redington and Simms. We stand with these companies because they stand by you, our customer. Consumer satisfaction is 100% with these companies. I know of no customer of ours who was not happy with the outcome if a problem occurred with any of these products. That is why we sell Chota, Orvis, Redington and Simms waders. Chota is a local Knoxville company that makes excellent waders and wading shoes. They are known for comfort and quality. Chota President and designer Frank Bryant makes sure of that. In their lineup you will find three chest waders, a knee high wader and their newest and hottest piece of gear, their “Hippies”. Orvis is another of our favorite manufacturers of fly fishing gear, including waders. We have been selling Orvis waders for 16 years. Orvis waders have great style and quality. Orvis stands behind everything they make. We like that. Simms is another company who we have worked with practically since we opened our store in 1994. Some of their lower priced waders are imported as most waders are. But, other models are made at the Simms factory in Bozeman, Montana. These waders use materials called Gore-Tex®. Gore-Tex products are more expensive than those using other breathable waterproof fabrics. It is up to you to decide if it’s worth the difference. Redington is owned by Far Bank, a company that also owns Sage and Rio. Redington offers some fine and unique waders. We are especially fond of their pant, waist-high waders. So here you have it, the Little River Outfitters lineup of fly fishing waders.